One of my ancestors who serves as my genealogical inspiration is my great aunt Ruth. Like myself she was a genealogist and wrote a number of personal essays that contain her memories of living at ‘Riverside Farm‘ as well as information she gathered on the Johnston and Basham family. The information she documented has been a great help in my own research and without her essay’s I would have had a much more difficult time. Furthermore, it seems her uncle, George Basham (1878-1954) was also interested in genealogy. He had recorded a number of musings his his diary, which I have yet to locate, he was also a photographer, postal worker, and was the first teacher of Mowat School from 1904-1905. Ruth Elizabeth White was born on 27 Jan 1908 in the Fork River district of Manitoba, Canada. Her parents Thomas White (1880-1909) and Sophia Harriet Basham (1880-1959) were both born in Hackney, London, England and immigrated to Canada on the S.S. Canada arriving at the port of Montréal on 15 May 1904. They most likely chose the community of Fork River as it was the home of Sophia’s parents and siblings who had immigrated to the area in 1903. 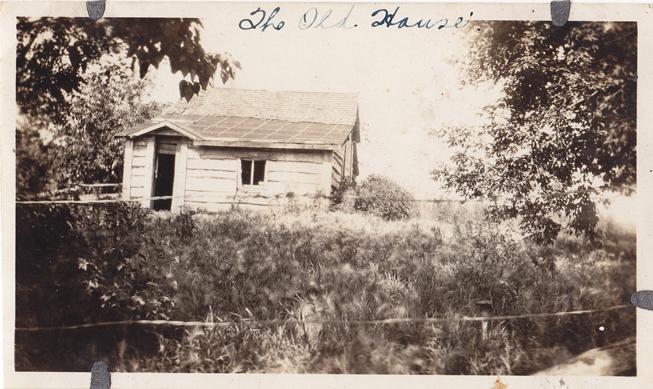 The OLD PAINTING of the house in which Ruth and her half-brother, Ernie, were born…Ruth on January 27, 1908. This oil was done by a friend of Ruth’s father, as a gift for Ruth’s mother Sophie, from her husband Tom, on their second anniversary. The painting shows the house that Tom built in the “wilderness”. It contained two rooms and was made of lumber and painted yellow. It was one of the few pioneer homes which had a brick chimney. It stood on the bank of the Fishing River. At the foot of the bank, a little yellow boat floated at anchor. Beyond the small clearing, trees formed a border. A low fence added to the charm of the scene. The painting served as a bittersweet reminder of the hard work Tom had done to make a pretty home for his bride. Ruth’s half brothers grew up in the little house. Tom had added a third room before he died. The painting hangs in the sunroom, and is willed to Ernie and his descendants. Here, we pay great tribute to the “girl from London” who braved the loneliness of her grief and the remote district in which she taught, in order to keep up the payments on the farm, which she and Thomas had so dearly loved. Each weekend saw her walking home ten miles over a trail-like road on the shore of Lake Dauphin, and along the edge of a meadow, where the bull of the Glendenning head came closer to look at her. During her teaching week she slept on the floor of the school. But the kindly Ukrainian and Polish people of the district never once caused her any alarm. Many years later, Jennie Janowski Situlski, who was a pupil in Sophie’s class in the Oak Brae school, wrote her memories of pioneer days. She said that Sophie was the first English speaking person the children had ever seen. She seemed like a doll to them, dressed as she was in her pretty clothes, the like of which they had never seen (Parkland Enterprise, August 1980). On 26 Mar 1912 Sophia married James Washington Johnston (1876-1967) and would have three sons: James Henderson Johnston (1913-1981), Ernest John Johnston (1915-2001), and William George Washington Johnston (1917-1944). Ruth called James Washington Johnston her “Pa” or “Pop” and he taught her how to dance all of the steps of the day. She never lacked partners at house parties or the “balls” in the Orange Hall, in the Fork River Village. James Washington became the chief engineer of the government fish hatchery on Snake Island on Lake Winnipegosis and the family moved to the island for several seasons before returning to Riverside to farm in earnest. 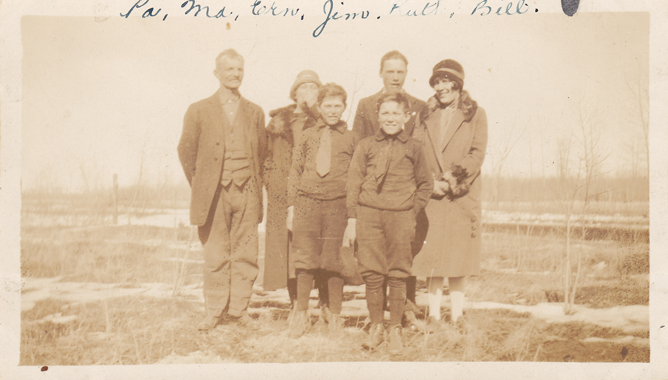 Ruth and her half-brothers James, Ernie, and Bill attended Mowat School No. 1232. 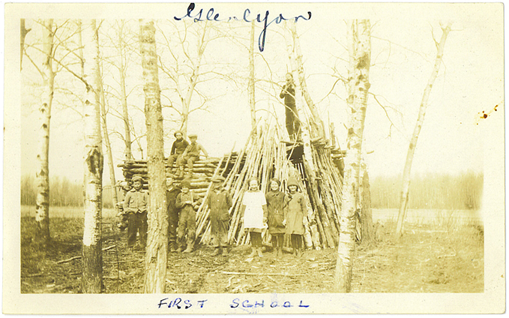 The school was located fairly close to the homestead and the children would have been able to walk to class each day. Ruth wrote in one of her essays that she had always wanted to be a teacher and since the tuition was only $50 at the Dauphin Normal School she took her chance and borrowed the money from her cousin Fred Storrar Jr. Ruth graduated from Dauphin Normal in Apr 1927 and taught at various schools across Manitoba including (but not exclusive): Glenlyon School (her first school), Roseisle School (1929), Bradwardine School (1934), Mowat School (1943-1944), King Edward School, Lord Selkirk School, and Principal Sparling School (1973). 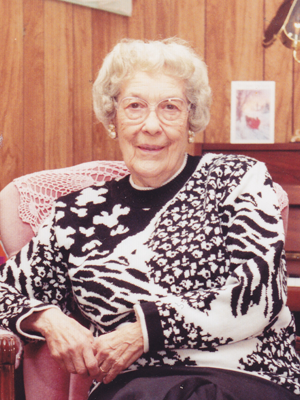 Ruth was the only former student of Mowat to return to teach at the school. 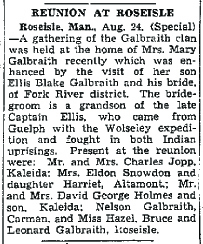 Ruth married Ellis Blake Galbraith (1912-1976) on 6 Aug 1938 in Dauphin, Manitoba in St. Paul’s Anglican Church. The couple then traveled to visit Ellis’ family in Roseisle before going on their honeymoon. They moved to Winnipeg in 1944 allowing Ellis to work in the city CPR yards. Through the years they took various trips together across the USA and Canada. Once her husband had passed away in 1978 Ruth also took a trip to England and Ireland, the homeland of our ancestors. Ruth passed away on 17 Feb 1999 at the Grace Hospital in Winnipeg, Manitoba, Canada.